That “global warming” is a controversy is a travesty. There is much to debate about global warming: to what degree it is caused by humans, what its effects will be, what we should do about it, etc. But global warming itself should not be under debate, because it’s simply a fact. That the temperature of the earth is rising is on par with the distance from the earth to the sun: it is an established fact based on math and careful measurements. Right now average temperatures are more than a degree (Celsius) above what they were during the Little Ice Age 400 years ago. One degree may not sound like a lot, but until the 20th century, global temperatures had fluctuated (up and down) less than a degree for the past 2000 years. Those are the facts. The question of whether humans are the primary cause of global warming is less clear, because it relies not on measurements but on interpretation of that data. It is almost certainly the case that humans are not the only cause of global warming. The earth has been rebounding from a dip in temperature in the 1600s, and on a larger scale from the Pleistocene ice age that was still in full force when humans were migrating to the Americas. However, it is also certainly the case that humans are contributing to global warming. We have raised the levels of atmospheric carbon dioxide to what are record levels for the last 400,000 years, and carbon dioxide is well-documented to be a “greenhouse” gas that raises the temperature of the earth when present in the quantities it exists in today. Still, for a long time I wasn’t convinced that humans were the primary cause of global warming. It was this graph that changed my mind. 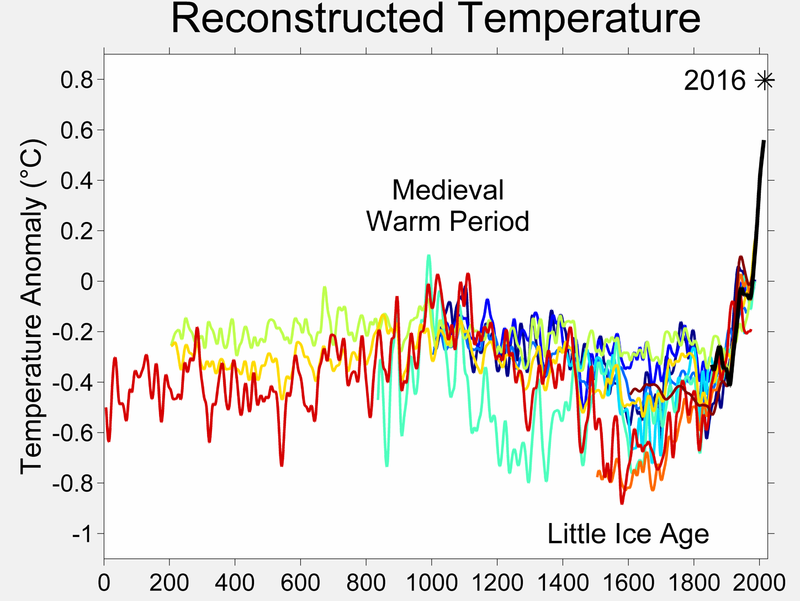 We can see a gradual increase in temperature starting in the 1600s, and then around 1900 a huge steep spike in the rate of change. I have yet to see any argument that the most obvious interpretation of the data is that the industrial revolution and following sustained carbon emissions have accelerated the warming of the planet. The final question is: should we be worried about it? Even if we accept that global warming is happening and that humans are the primary cause, does that mean we need to seriously change our way of life? In my opinion, yes. That’s not to say that high carbon dioxide levels would somehow ruin the planet. A hundred million years ago carbon dioxide levels were more than 20 times what they are now. The earth will get along fine with pretty much whatever we can throw at it. What we should we worried about is the widespread extinction of plant and animal species — including us. Life has trouble evolving to large, sudden changes, as evidenced by the mass extinction after the Chicxulub impact, which killed off many species, including (eventually) all species of dinosaur. Life will continue regardless of what we do to the environment, but we may not weather it if the food crops we depend on and the plant and animal species we get our medical breakthroughs from disappear. In addition, there’s the question of sea level change. Sea levels have risen in the past 100 years, and will continue to do so at a faster rate over the next 100 years. This isn’t a problem in and of itself for the same reason that the continent layout 500 million years ago was somehow “better” than it is now. The problem is that we’ve arranged our cities and our lives in a certain way, and we won’t be able to sustain that arrangement given the current acceleration of global warming and sea level change. Many coastal cities will be underwater in a few generations if we continue at the current pace. That certainly doesn’t spell the end of our species, but it would be a monstrous public works project requiring tens of millions of people to relocate. I think the easier option is to limit carbon emissions by switching away from fossil fuels (which we only have enough of for another century even by the most blindingly naive estimates). I’m not saying “Listen up America, YOU MUST DO THIS.” I’m just saying reducing carbon emissions, while enormously expensive and difficult, is a much easier option than dealing with more unpredictable and violent weather, rapidly rising sea levels, and the behemoth infrastructure changes that would necessarily have to be made because of these problems.